A new law will impair Canadian development investments in Cambodia and tighten its government’s grip on civil society. Cambodians protest their government's new law cementing its grip on civil society and aid. Photo courtesy LICADHO. More than two months have passed since the Cambodian government released the second draft of the controversial Law on Associations and Non-Governmental Organizations (known colloquially as the NGO law),and the country’s civil society organizations are still holding their collective breath. The government has long called for an NGO law, though no one seems able to articulate exactly why it is needed. Official statements have been all over the map — some say it’s needed to control “illegal activities” among NGOs; other say it’s to increase transparency; some even say it’s necessary to combat terrorism. But the release of the second draft of the law dramatically exposed the government’s phony rationalizations. The law, as highlighted in this analysis, is simply a transparent attempt to control independent civil society and stifle dissent. It’s also a blatant violation of domestic and international protections on association, assembly and speech. Besides affecting local groups, the passage of this law would significantly undermine the efforts of international donors and NGOs working in Cambodia, including the Canadian International Development Agency. CIDA invested a projected $17.03 million into development programs in the country between 2009-2010. Among other things, the proposed law imposes a burdensome and mandatory registration process onall NGOs and associations working in Cambodia, and outlaws those that don’t comply. Meanwhile, it gives authorities unbounded discretion to approve registration applications, with few substantive guidelines to steer their decisions. There is no appeals process if registration is denied. In this way, the new law takes government confrontation of NGOs and associations behind the scenes, out of public view. One paperwork error, real or imagined, and the organization will cease to exist. The proposed law is also sloppy — one example being its apparently unlimited scope. It’s unclear whether this aspect was intentional, but the International Centre for Not-for-Profit Law (ICNL) concluded that the law would require “every group of individuals who gather together with a differing level of frequency and perform the broadest variety of imaginable activities, from trekking and football fans, to chess and silk weaving groups,” to register. Failing to do so would be a violation of the law. (So would, apparently, founding an NGO or association without the required number of Cambodian citizen “founding members” required by the law — three and 11, respectively). By impairing and even closing down local groups, the law will stifle information needed by funding bodies like CIDA, and make it more difficult to design, implement and monitor development programs. Local groups including informal networks and associations are often the best source for information on the human rights and development landscape. For example, one of CIDA’s main development goals in Cambodia is to help increase access to legal land titles, which would strengthen communities’ ability to fight land grabbing. Land grabbing is closely tied to government action and without politically independent partners, CIDA’s goals will be compromised. Moreover, CIDA endorses the idea that the promotion of civil society is vital in fostering respect for human rights and encouraging development in Cambodia. 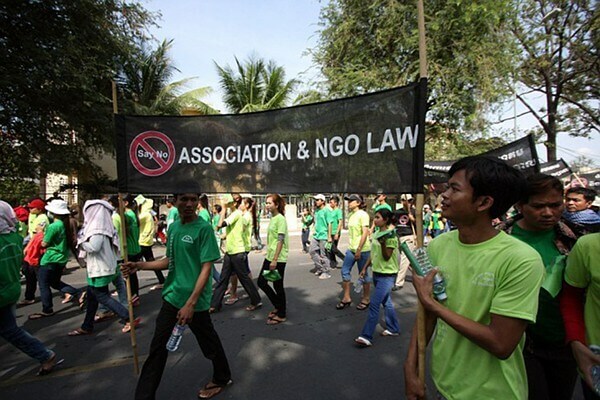 Canada-registered NGOs working in Cambodia are also concerned. LICADHO Canada, an organization that combats land evictions in Cambodia, says that the draft law, in its current form, would mean that many of the community groups LICADHO Canada works with would be deemed illegal entities and their activities outlawed if the groups refuse to conform to registration requirements. LICADHO Canada is one of several NGOs in the region working to protect communities from land grabbing. It may seem incongruous that the Cambodian government feels compelled to pass a specific law in order to strengthen its grip on civil society. This is a country, after all, where an activist was recently shot dead after helping his community protest a military land grab. Nearly 40 human rights defenders were imprisoned as of November 2010. The authorities are shameless in persecuting those who pose a threat to their grip on power and resources, even in the most minor cases. But the fact that the government feels the need for new legislation indicates that they do indeed have an Achilles heel. Under current law, confronting NGOs is a messy and embarrassing business that often requires trumped-up charges. This tarnishes Cambodia’s reputation and threatens the two things that the government really cares about: Western aid money and the international legitimacy that comes with it. Cambodia’s leaders don’t want the country to become another Burma. (They also need the money; foreign aid still represents half of the national budget). The government’s release of the second draft of the law on March 24, 2011, produced an uncharacteristically vocal and unified outcry from local and international civil society organizations. The draft law was universally condemned as the most significant threat to the country’s civil society in years. Even Cambodia’s major foreign donors chimed in, most notably the United States, which publicly stated that passage of the law in its current state could threaten aid money. While it is too early to tell whether the outcry will ultimately impact the law, there is some reason for optimism. Many expected that the government would push the law through the Council of Ministers and National Assembly immediately after the release of the second draft, as has been done in the past with other controversial legislation. That has yet to happen. It appears now that the backers of this law are regrouping. It is unclear what their next step will be, but this much is certain: continued opposition from Western donors, including CIDA, and international NGOs is key to preserving Cambodia’s independent civil society. Canadian taxpayers should also be concerned: if the law passes, the effectiveness of CIDA’s $17.03 million investment will be compromised by the Cambodian government’s total discretion over the operation of CIDA’s local partners. The Cambodian government has played chicken with Western donors before, cynically manipulating their fears — China’s growing influence, the prospect of abandoning ordinary Cambodians, and the need to “engage” at all costs — in order to keep the money flowing. Too often it’s the donors who flinch. This time should be different. Civil society teeters on the brink, and all of the proverbial chips are on the table. This is not the time to be timid; it’s time to call their bluff.